Last year we finally did the American tradition of camping out in the back yard. Or in our case, the front yard. It had been a really rainy July, but we finally had a few nice weekends in August to set up the tent. The first time the kids camped out along with Dova’s BFF. 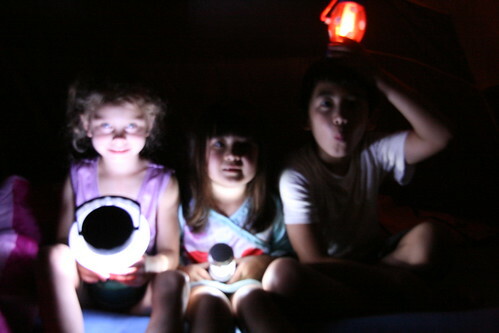 They loved making scary faces with their lanterns. 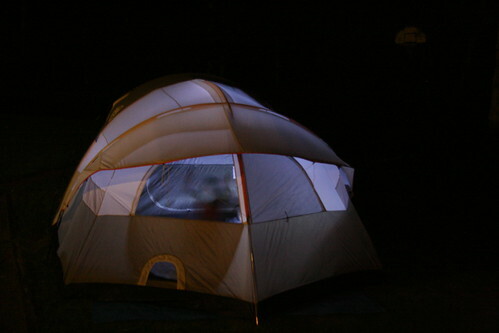 The next weekend, we piled into the tent as a family. I took out a book of ghost stories and picked a story that was marked as mildly scary. We didn’t want the kids to have nightmares on our little campout. The story was about someone or something coming to the cabin door and knocking. Afterward, the kids were not impressed at all with the story. It wasn’t a bear or terrible monster knocking at the door, just someone they knew trying to scare them. So off to sleep we went. Except I was the one having nightmares. 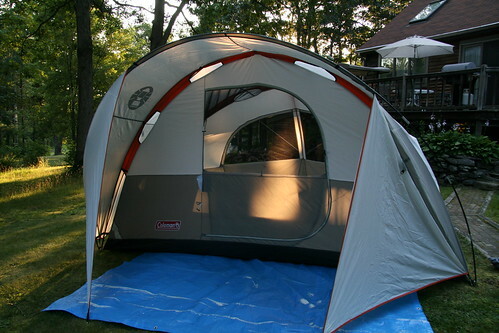 Our cat kept scratching at the outside of the tent and I kept thinking it was someone trying to slash the tent and kill all of the occupants. I was dreaming whether or not I should wake Doug up. I kept kicking myself for not bringing some sort of weapon into the tent. The lanterns might suffice to knock someone out, but not if Doug is sleeping! Should I wake him or not???? It didn’t help that it was freezing cold all night. After waking up with no slaughter around me, I later learned that the temperature dipped down to 42F. In August! Needless to say, there will be no more scary or even mildly scary ghost stories for this mom. Good thing August comes around once a year as this draft is a year old! LOL! Better you than them, though, because then ALL of you would have been awake!! that's about all the camping I'd be up for these days - in the comfort of my backyard :D looks like fun times! Hello Angela you have a very interesting blog, i will visit ur blog very often, hope u go for this website to increase visitor.Happy Blogging!! !